How to bake a cheesecake: video on how to bake a cheesecake easily. This Step-by-Step Video Shows How To Bake A Cheesecake. 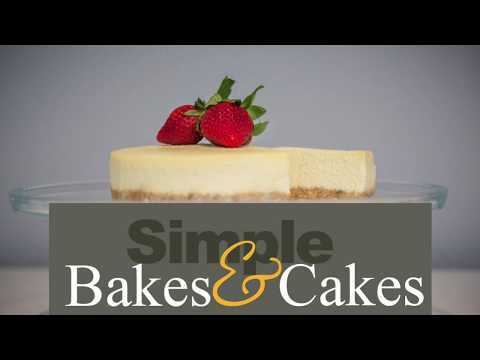 It is a simple process to learn how to bake a cheesecake and this short video explains in a step-by-step way. For all the ingredients check out our basic cheesecake recipe here. I am often asked how to bake a cheesecake and then when people are told the process they will say “Oh, that’s too long winded”! But, believe me, it is well worth the effort. Firstly, you need to understand that any baked cheesecake recipe requires you to do the same process, no matter what the actual ingredients are. There are methods to make a no bake cheesecake which can appeal to bakers who want a quick fix bake. Put simply, you need to mix the ingredients properly and bake them in the oven using a bain-marie which is a simple bath of hot water. This baking method helps to bake your cheesecake evenly throughout. Learning how to bake a cheesecake need not be difficult. It really is very simple and easy to do. Pre-heat your oven to 160 degrees centigrade. Cut out a circle of baking paper the same size as your sprin-form baking tin. If you have a smaller or larger baking tin you will need to resize all your ingredients, so try using my recipe converter to help you. Place your chosen biscuits for the base into a plastic food bag and crush using a rolling pin or similar solid object. If you have one, a food mixer is a better way. Make sure the biscuit is reduced to the finest crumbs otherwise your cheesecake base will be lumpy. Meanwhile, melt some butter in a small saucepan, add sugar and finally the crushed biscuit crumbs. Mix thoroughly and leave to cool. Lightly grease your baking tin on the base and the sides and place the circle of parchment paper into the base of your tin. Spread the biscuit crumbs over the base of the tin using your fingers, scraping down the sides as you want a nice thin base to your cheesecake and not one where the sides are coated in crumb. This makes the finished cheesecake look nicer! In another bowl mix the soft cream cheese with the sugar, making sure you mix it for at least 3 minutes so all is very well combined. Add the cream, vanilla extract, pinch of salt and finally the eggs and any other flavourings you may wish to use. Most people like to use a paddle attachment to their food mixer but I prefer the whisk as this adds air and makes for a lighter cheesecake mix. You may want to try both to see which style you prefer. Once mixed pour into your baking tin. The baking tin needs to have a sealant around it to prevent the water bath from leaking into the ingredients, so wrap a single or if you have to a double layer of foil around the base and up the sides. Place the tin into a roasting tray and put onto a lower middle shelf in your oven. I found this helps prevent the top of your cheesecake from burning during the cooking process. Now fill the roasting tray with boiling water from a kettle making sure to not let it go above the silver foil wrap and usually up to about halfway up the baking tin. Bake for the length required. Turn off the oven and leave to rest a little longer inside the oven. I find this helps with the even baking and drying out of the cheesecake. All this may sound very time consuming but once you have learned how to bake a cheesecake time will fly each time you do it. Now remove from the oven and leave to cool on a rack. Once cold, remove from the roasting tray, wipe down and wrap in cling film and store in the fridge over night. In the morning you are then ready to unwrap and decorate as required. Now that you have learned how to bake a cheesecake, please comment below on your favourite cheesecake flavours and SHARE this post. Thanks.